After the basic functionality of my library is implemented, it is the time to add some quality assurance to the project. One of the most important quality assurance methods is unit testing. After some experiment in Jsunit, I found some difficulties that I cannot get over with. Then, when I try to run my test in testRunner, it will tell me time out in loading the test file. However, if I put my file inside the Jsunit folder, and change the script tag accordingly, it works. This is very confusing to me. I have no idea why this happens. Its documentation on how to setup the testing environment is very short and not quite helpful. 2. 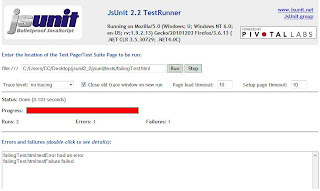 Jsunit cannot test the AJAX response and its callback. Since my library is heavily related with AJAX, I need to test if my AJAX request will get the correct response. However, in Jsunit, I didn't find a way to test it. I think it is because Jsunit runs the test suite asynchronously, so it cannot wait for the AJAX response. I did some research online about the callbacks testing. Some people suggest using the clock object in "jsUnitMockTimeout.js" to simulate the state of after some time(say 10 secs). I tried it, it only works for the "system.timeout()" thing but not for the AJAX response. Anyway, I realize that Jsunit is not supported by its developer any more, so I guess I need more research on how to overcome these problems. 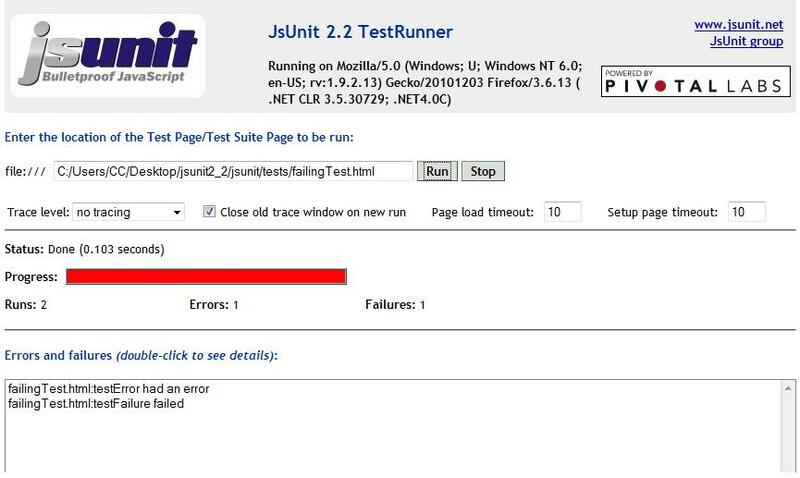 In all, my opinion is that Jsunit is an acceptable tool for unit testing. I certainly hope I can find another tool to replace it.